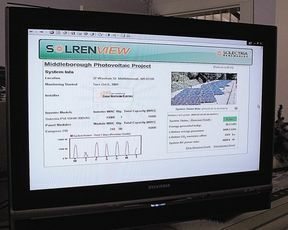 THE TV MONITOR: in the lobby at the Gas and Electric Department’s administration building provides up-to-the-minute information on the solar array at the G&E’s electric division complex. MIDDLEBORO — Gas and Electric Department customers who visit the administration building on South Main Street can learn all about the utility's experiment in solar power. On the counter in the lobby is a TV monitor that shows, up to the minute, how much electricity is being created as a result of the solar panels that were installed on the roof of the garage at the electric division complex on Wareham Street last year. While the system is pretty much for educational purposes only - the G&E's as well as the public's - it is capable of providing sufficient energy to serve two to four homes, G&E General Manager John Granahan said. The department sends itself a monthly bill to show the credit it receives for the power generated by the series of 80 panels that generate an average of 2,986 kilowatt hours of electricity per month, while the average G&E residential customer uses about 750 kilowatt hours of electricity a month. "We have had inquiries from developers about solar power, and now we can discuss our own experience," the manager said. Last fall, the G&E commission adopted a "net metering" policy that addresses how G&E customers who install renewable generation technology like solar panels or wind mills can integrate the systems into the department's power supply. Mr. Granahan said there have been a number of inquiries but no one has filed a formal application to date. The information that is available "live" in the G&E lobby can also be viewed on the department's web site. It refreshes every 15 minutes. "We did this more as a learning experience, and to get into green energy more, Mr. Granahan said. "There will be some payback, but it will be quite modest and will take many years, I would guess 25 or more." The department saved money on the 16.8 kilowatt Evergreen system by purchasing it through the Massachusetts Municipal Wholesale Electric Company, a consortium to which the G&E belongs, but the costs still totaled $132,208. The same is true for anyone who plans to install such technology at this point, Mr. Granahan said, although the price for solar panels has come down in recent years. "People have the satisfaction of making a green statement," he said, "but like all technology this is changing quickly and the costs will come down while the cost of electricity goes up." In addition to discussing this tiny but interesting slice of its power supply, during a recent interview the G&E manager reported that the utility experience "small but negative growth" in gas and electric loads during 2009, in part due to the economy and in part, apparently, due to conservation on the part of customers and weather conditions. Gas purchases were down 1 percent over the previous year and electric purchases declined by 2.6 percent after years of steady growth at 2 to 3 percent, Mr. Granahan said. Meanwhile, the department added 40 new gas customers and 230 new electric customers. Mr. Granahan said the G&E, which annually posts about $30-35 million in sales, was in good shape for the year compared with some utilities that experienced up to 10 percent reductions in sales. To be prepared when the economy improves again, the department made improvements that will increase the capacity of its electric division to 90 megawatts, nearly double the electric peak that was reached last year, the manager said. The $4.2 million upgrade was paid for through the department's depreciation fund, which is maintained at around $2 million a year to make such capital improvements possible without borrowing. The department also replaced 2,400 feet of old cast iron gas main and upgraded another 3,000 feet. At year's end, the G&E reduced electric and natural gas fuel adjustment charges in response to a drop in market prices.